Gas prices in Canada are already at multi-year lows, but they're not done falling. Pump prices are “set to nosedive” in the coming days, thanks to OPEC’s decision not to support oil prices, a prominent gas price forecasting site says. TomorrowsGasPriceToday.com is advising motorists to “wait until Saturday and Sunday” to fill up. 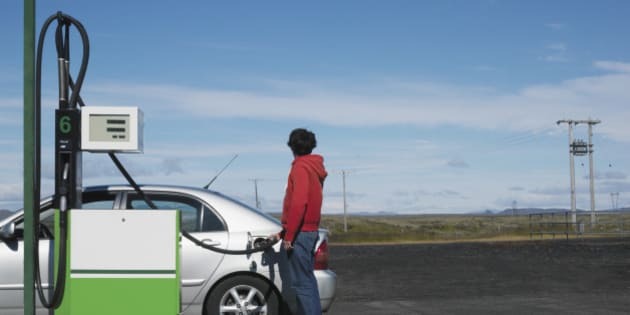 Parts of the country could see gas prices fall below $1 per litre, the first time in at least half a decade that many regions have seen prices this low, analysts are telling the media. In the Prairies, where prices are typically lower than elsewhere, gas is already selling for below $1 a litre in many places. Calgary was seeing pump prices as low as 94 cents per litre were on Thursday. Other parts of the country are already close to $1-a-litre gas, including Ottawa. Toronto gas prices were hovering around $1.14 on average on Thursday. In a closely-watched meeting Thursday, the Organization of Petroleum Exporting Countries (OPEC) decided against cutting oil production and maintained its target production level of 30 million barrels per day. That means the oil-exporting cartel will not be shoring up oil prices, which have fallen some 30 per cent since their peak earlier this year. That news sent energy stocks and the Canadian dollar downwards on Thursday. The S&P/TSX composite index dropped 119.78 points to 14,918.63. The energy sector lost almost seven per cent while January crude oil futures fell below $70 U.S. per barrel, to $69.05. The loonie fell 0.77 cents by mid-day Thursday, to 88.23 cents U.S. There had been hopes that OPEC oil ministers meeting in Vienna would cut production in order to put a floor under prices, which have steadily fallen because of a strengthening greenback, lower demand prospects and, particularly, a glut of oil. But OPEC will keep its production unchanged at 30 million barrels a day and that means bad news for the TSX energy sector, now down about 10 per cent year to date. What’s bad news for the oil exporting industry is good news for consumers, who stand to benefit from more disposable income as energy prices come down. Some economists say the decline in oil prices will bring a reversal of fortune to Canada’s economy, with oil-importing, manufacturing-heavy areas like Ontario and Quebec benefitting, while oil-exporting areas like Alberta and Newfoundland face harder times.